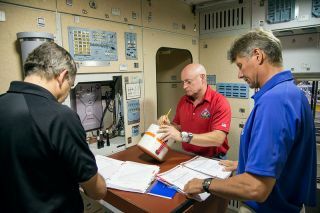 Cosmonauts Mikhail Kornienko (left), Gennady Padalka (right) and NASA astronaut Scott Kelly (center) work on emergency training in a mockup of the International Space Station in Houston. What do you want to know about the upcoming one-year mission to the International Space Station? NASA officials will discuss the yearlong station mission in a series of news conferences Thursday (Jan. 15), and you can watch the briefings live online. The first briefing — featuring information about the mission itself — is set to begin at 12 p.m. EST (1700 GMT), with a second briefing scheduled for 2 p.m. EST (1900 GMT). NASA astronaut Scott Kelly and cosmonaut Mikhail Kornienko, the two crewmembers staying on the station for one year, will participate in the 2 p.m. EST news conference. You can watch both yearlong mission briefings live on Space.com via NASA TV. "Kelly and Kornienko are embarking on a first-ever yearlong mission to the station," NASA officials wrote in a statement. "The valuable scientific data collected will provide insight into how the human body responds to longer durations in space, supporting the next generation of space exploration." Cosmonaut Gennady Padalka — scheduled to fly to the station with Kelly and Kornienko from the Baikonur Cosmodrome in Kazakhstan on March 27 — will also participate in the 2 p.m. EST briefing. Padalka will fly back to Earth in September while the two other crewmembers stay on the station until March 2016, according to NASA. Michael Suffredini, International Space Station program manager; Emily Nelson, International Space Station expedition flight director; Julie Robinson, International Space Station program scientist; and Steve Gilmore, lead flight surgeon for Kelly will participate in the 12 p.m. EST briefing. The space experts are expected to discuss science, spacewalks and other details of the long-duration mission. Kelly's yearlong mission will mark the first time an American has spent a continuous year in space. Some cosmonauts spent a year or more on Mir in the 1980s and 1990s. "What makes this exciting for me, this one-year flight is about the science and everything we're going to learn from expanding the envelope on the space station greater than what we've currently done," Kelly told members of the press during news conference on Dec. 18. "If we're ever going to go to Mars someday, the International Space Station is really a great platform to learn much more about having people live and work in space for longer durations."